I have chosen tabs as a navigation and each tab has a new view in it .On top of this, i have grouped all these tabs into modules and chose module tabs for navigation. The problem that I am facing here is the arrows on top seems functional on secondary tabs but in primary when arrows are used user misses context as top-level tabs move away. and another option I tried was putting more at the end of top-level tabs. So arrow is necessary here again and it is will be a mix of option 1 and 2 which seems wrong I think. Let me know if this has any other solutions. The same question had been already raised earlier. 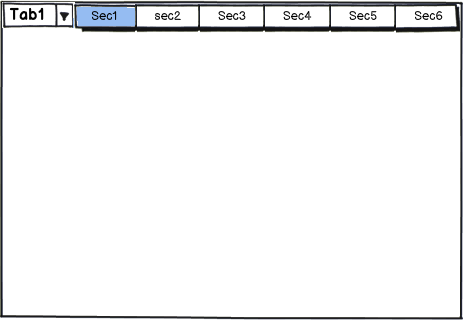 What about handling primary modules as horizontal tabs and secondary modules as vertical tabs? I have added a very rough mockup just to convey the idea. From your design, the user will have to click on a more button to view the remaining primary modules. So,if the user don't have to shift between primary modules very frequently, you could give the option for user to set an initial context for primary modules and allow the user to shift between the secondary modules. NB: The way to select of primary module in the mockup may not be the correct option. I just put it up to convey the idea. Vertical (a.k.a. 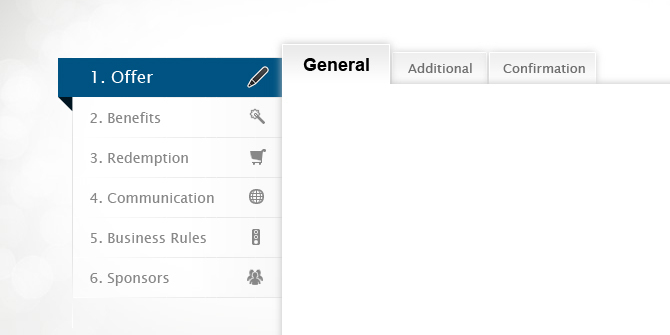 “Sidebar”) navigation is a way of showing a persistent site or application structure along one side of the product. Unlike tabs, vertical navigation is appropriate when the number of categories is not small, or is user-customizable (such as folders or tags in an email client). It is considered a “safe” navigation pattern because it is familiar, flexible, and doesn’t take up much space. It is often used when there is no other obvious choice. You could try using some of the vertical space with "Tabs" and Horizontal Space with "Sub Tabs". Much like the image attached below. I'm not sure why you're so adamant on tabs. When you have multiple layers of navigation tabs become confusing, frustrating and difficult to navigate. It doesn't take much screen space when the user is browsing the selected page and neatly folds out when the user wants to navigate. I know that maybe this isn't a direct answer to your problem but I hope it inspires a better solution. You could minimize the tabs furthest from the selected tad. ...Since I am also working on complex dashboards and have encountered the same issue several times, I turned up into turning tab elements into vertically collapsed nested dropdown elements. edit: About your concern that you need to use every pixel available - when users need to navigate, they don't really care about what's on the current screen; they just want to get there easily. No-one is going to play with your menus (although many of us would like them to! ), they just need of an intuitive way to navigate to the page their want. Nothing more straightforward that what they are already used to (and I proposed above).. nested dropdowns. edit2: I well deserve the downvote, but I didn't get what you asked for before you asked again. Check this out. If you remove the 'tab' style on the top menu, then, even scrolling out wouldn't keep you 'out of context', would make more sense that having a 'tab style' being out of view. Not the answer you're looking for? Browse other questions tagged interaction-design user-behavior accessibility psychology experience or ask your own question. How to hide main navigation?